SPCR • View topic - Dell G2410 -> any owners out there? Dell G2410 -> any owners out there? Post subject: Dell G2410 -> any owners out there? I'm looking to get a new primary monitor and the Dell G2410 has caught my eye. Any current owners with feedback? I'm seriously considering buying one of these. Unfortunately I haven't been able to find much owner feedback anywhere. For me the most appealing part of the G2410 is the fact that it's a 24" widescreen that uses no more then 17,5 watts when calibrated. I don't see any PVA screens using such low power. Also I really like the industrial look of the G2410. I have used a g2410 since the end of july and i can not think of any monitor even getting close to it performance wise. The lack of backlight bleed makes moviewatching a joy and the led backlightings continuous light (no flourouscent flickering = no eye strain after a couple of hours). My mother bought a BenQ g2411 at the same time as i bought my dell and i had some comparison experience between them. The BenQ is cheaper ofc. But the extra cost for the dell is worth every penny. Great contrast, no backlightbleed, ecofriendly, silent (low wattage and no flickering flouroscent lightning), great colors for a TN-panel. Great! Thanks for the mini-review. I think more LED illuminated displays are coming shortly. Dell, as always, is just the first fish of a big shoal. Interesting, BUT... no S-IPS monitors with LED backlight? Owning a Dell 2007WFP monitor now which I'm extremely pleased with the display. In fact I tried at one point swapping out for a Dell 24" which was not S-IPS and after a few days of fiddling with it sent it back. No matter what I did to the colors I couldn't get it as good as the 2007WFP. Would like something larger now but not willing to accept a reduction in quality. My "quiet PC" build: [email protected], Ninja RevB (passive), Gigabyte DS3, Corsair 520HX, Antec Solo, Sapphire 5750 Vapor-X , Samsung 850 EVO, 6Gb RAM. If you're after low price and low consumption, TN is the way to go. The other panels cost more and use more power. Personally, I will take quality over price and power anyday. I'm a mainly budget user but a monitor is not something for me to go cheap on. I value image quality, viewing angles, construction and ergonomics too much to go with a budget TN. There's more to life than just "low power consumption", unless you're trying to "save the world" or reduce your energy bills by a few dollars a year. Currently an owner of a Dell UltraSharp 2209WA 22" s-IPS LCD. Very happy with it so far after having owned it for seven months. The new Dell U2410f 24" IPS looks to be an excellent monitor also. Even though it's double the price of a lot of TNs the same size, it's still worth the price if you're after a premium quality monitor. For 24" TNs, you may also look at LG's Flatron range. They seem to be quite well made and come with a 3 year zero dead pixel warranty as well. LG W2442PA is one of the models. There is an H-ISP panel frÃ¥n Apple that came out last year - the Apple LED Cinema Display - but it draws about 212 watts. There's also TN LED displays from LG and Benq out now. The LG W2486L, Benq V2400 Eco and Benq V2410 Eco. The Benq monitors have 5 000 000:1 in dynamic contrast and draws 28 watts. I have been using the 22'' model for 1 month and you can see some photos at this link. It is THE BEST 200 eur DEAL ever made in the last years. An accurate misuration tells that it draws 14 watts, the colours are way better than my 2004 philips 190s5fs (of course it's always a TN, but you already know it...). Your eyesight isn't stressed after some hours, LED backlight let the black BE black and not dark grey, the enclosure is enviromental friendly, stand by draws only 500mW. Responsive enough for gaming, nice enough for watching dvx and hdtv (and so DVB-T, I trashed my 14'' crt tv too). Do you do serious photo editing? Otherwise, don't bother with PVA and IPS and consider one of the best TN panels for quality and consumption. Honestly I don't know if that for 24'' the same applies. There is some indications that Dell will release a new 27'' monitor called U2711. It is rumored (or maybe just wishful thinking) that it will have the same panel as the new 27'' iMac - in other words, an IPS panel with LED backlight and a resolution of 2560x1440. Guys, how can it be that LED monitor has a higher contrast than fluorescent bulb illuminated one? All people do notice this phenomenon. - can be distributed across the display to provide local dimming, instead of just having a bar of light on the edge that is then diffused across the back of the screen. Dell put the g2410 on sale again ($50 off), so I ordered one. 2 weeks before it arrives. I expect moving up from 16x10 to 19x10 for native gaming will trigger HD 5770 envy. Come on non-OEM cooling solutions. Let me know if it will be as good as 22'' one! even as a used beater, tho, the 24" monitor was incredibly good... if you do image or video processing for a living, you'll know that there are very few lcd monitors out there that can rival a good crt for gamma and color. unfortunately those big crt's are tantamount to putting a space heater in your office, lol, so i moved a dell s2409w, which has been great, but of course not nearly as good of a picture. You meant moving up to 16x9, right? FWIW, I'm an IPS snob who really likes Dell's new TN panels. I've seen a 22" (model forgotten) & 2 E2310H LCDs, and all have given excellent colors and much better horizontal viewing angles. Excellent choices for all but the pickiest users IME. I work with an S-IPS panel screen in the lab (Dell 2408WFP) and with a TN panel screen at home (Viewsonic/Optiquest Q22wb). Yes, there are differences, especially in grey resolution and colour representation, but these aren't profound enough to call TN a regress. I didn't like the light sensor, as it caused the screen to be too bright. 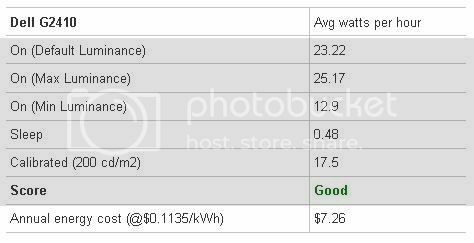 Please can you see which is the consumption using my settings (14w) ? How curious, it's lower... maybe it's due to the LCD being behind an old APC with a non perfect sine wave.